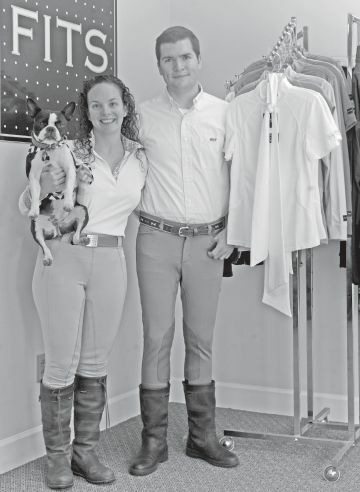 FITS Riding Ltd, the internationally acclaimed riding clothes company, has moved to Aiken. Established in 2005 in Portland, Oregon, FITS creates and sells technical riding gear with a traditional look. Best known for its patented-design full seat breeches, FITS also has show shirts, belts and stock ties. The company has an enthusiastic following that includes top riders in many disciplines, especially eventing and dressage. Now it has new owners and new headquarters right in the center of downtown Aiken. The new owners, Lida Bard and Brian Allenby, are both 2013 graduates of Elon University in North Carolina. Lida is a lifelong horsewoman who competes in eventing. Brought up in New Jersey, she came to Aiken after her parents relocated to the city while she was in college. Brian, also from New Jersey, followed Lida south, and got his introduction to horsemanship at her parents’ farm. The couple have been engaged since 2013 and will be married this October. They formally purchased FITS Riding Ltd in May. After graduating with a degree in creative writing, Lida found a job working for the Aiken Downtown Development Association, where she was in charge of marketing, social media and writing a bi-weekly newsletter. Meanwhile, Brian, whose degree is in environmental science with minors in business, geography and GIS systems, had a job in New Jersey as a technical support technician for a proprietary software company. When he moved to Aiken, the company asked him to stay on and work remotely, which allowed him to make the move without having to worry right away about finding work. Both Lida and Brian joined Aiken Young Professionals Association. “We were looking for some kind of equestrian business to buy,” says Lida. In January of this year, her father, who has always had his own businesses, was searching online, where he found a listing for a riding apparel company that was for sale. Lida and Brian were excited about the prospect of owning such a successful company, especially one that made clothing that Lida already loved. But there was a lot more work to do before buying the company. The couple, accompanied by Lida’s father, flew out to Portland to meet the company’s founder, Sheryl Rudolph and learn more about what FITS does. They spent time examining the company’s structure and finances, and went through an extensive due diligence process before deciding to go ahead with the closing. They finalized their purchase in mid-May after spending three weeks in Portland getting to know how all facets of the company work. Soon afterwards, they moved into the new FITS headquarters on Arbor Terrace, just off Laurens Street in downtown Aiken. “We aren’t retailers,” explains Lida. “This is the company headquarters. We do have samples of our product line here to show to reps, but we don’t sell any clothing.” Currently, the FITS brand is carried in Aiken at Oak Manor Saddlery. What makes the FITS brand different? According to Lida and Brian, both of whom wear riding breeches at work, the difference starts with fabric and extends to design and craftsmanship. FITS full seat breeches, the signature product, are made from compression material that is similar to what is used in apparel made for NFL players. It has more lycra than typical riding pants, and provides more stretch and support for the muscles. The breech is accented with Powermesh on the lower leg to make the pant thinner and more breathable under a boot. The deerskin leather panels are segmented and perforated, providing more stretch, flexibility and breathability than traditional leather panels. The design incorporates a patented gusseted crotch and a Powerstretch ab panel for support and a flattering fit. FITS tops and show shirts are also designed to be comfortable, practical and attractive. They are breathable, with strategically placed mesh panels, and they provide protection from the sun with an SPF of 50. The material incorporates unique natural, odor and bacteria controlling fibers that last throughout the lifetime of the garment. The show coats are made of a mesh material that is opaque when worn, but if you hold them up to the light, you can see right through them. They are cool and breathable enough to be comfortable even on days where show coats are waived, and they are even washable. Although the look of FITS is traditional, the designs and the fabrics are distinctly 21st century, representing a modern understanding of how apparel can help improve athletic performance. All the clothing is manufactured in the U.S. from U.S. sourced materials. Lida and Brian are excited about their new venture and happy to be part of Aiken’s vibrant horse culture. Lida will be working on new product lines and promoting the brand, while Brian is looking forward to doing more marketing and sales. FITS is already sold in 12 countries including the U.S. and Canada. Lida and Brian have plans to go to a trade fair in Germany later in the summer to expand the brand’s European presence.